Mark of the Ninja isn't only one of the best stealth games to be released this year, it's the best stealth game in years. Similar to pirates, zombies and space marines, ninjas tend to be interpreted in a variety of ways. Running through Ninja Gaiden leads you to believe that all ninjas run around city streets destroying monsters the size of buildings, while Mini Ninjas makes you think that they’re all just stinkin’ adorable. But the best ninjas have always been the ones that you don’t see, the warriors of shadows that know more ways to kill a man than we even think are possible. All of this being said, it’s easy to see why stealth games have been populated with our hidden heroes in the past. However, it only takes a quick glance at Mark of the Ninja to realize that this is far from a derivative ninja simulation. 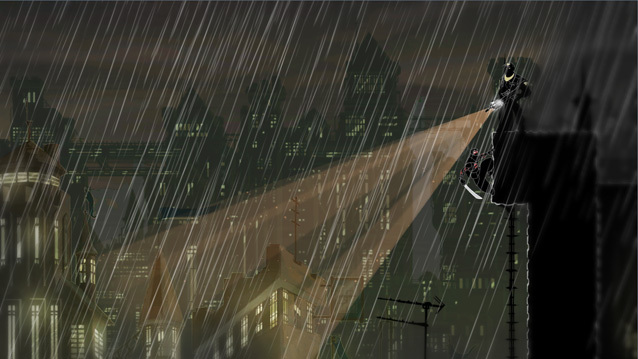 The art style, the 2D Metroidvania-esque levels, the cartoonish violence; none of these are quite typical of a stealth game, and that’s because Mark of the Ninja is far from typical. In fact, it’s not just one of the best stealth games released this year, it’s the best stealth game released in years. Players take control of a ninja warrior seeking revenge against the man who destroyed his clan, but the game’s plot really isn’t developed beyond that. One of the only missteps the title makes regards its inability to make us care too much about the events at hand, but the gameplay is more than enough to hold your attention for multiple playthroughs. Each level is presented as a semi-linear stretch of rooms, vents, rooftops and hallways that present plenty of hiding places for our sneaky ninja, whether it’s behind a potted plant or on top of the lights that enemies think protect them. As opposed to most stealth games, remaining unseen is absolutely essential to your survival. It’s not impossible to kill a guard hand-to-hand, but doing it twice in a row just might be. Instead of bolting through levels, you’ll be crawling along ceilings and slithering through vents like the predator you are. For the peaceful types, killing enemies is totally optional. In a nice addition that many “open” stealth games could learn from, players are rewarded for however they decide to play the game. That doesn’t mean one way is particularly more difficult than the other; rather, both options present various routes that can be taken to the end of the level. Is there a guard and his dog in the way? Why not swing over their heads and leave them clueless? For the more impulsive types, how about taking out that light and using the darkness to knock out the dog and put a sword through the guard’s throat? The paths that are possible are numerous, and all of them are a blast to play through. 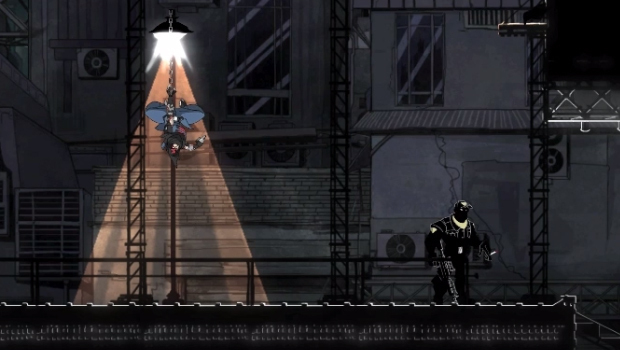 A 2D stealth game would never be expected to have exceeding depth or content, but Mark of the Ninja is packed to the brim with extra incentives to drop more time into the already lengthy campaign. After the eight or so hours you put into your first playthrough, plopping back down for a round of New Game Plus is a no-brainer. The gameplay itself is addictive, and every silent kill you get away with leaves behind an adrenaline rush that keeps pushing you forward. 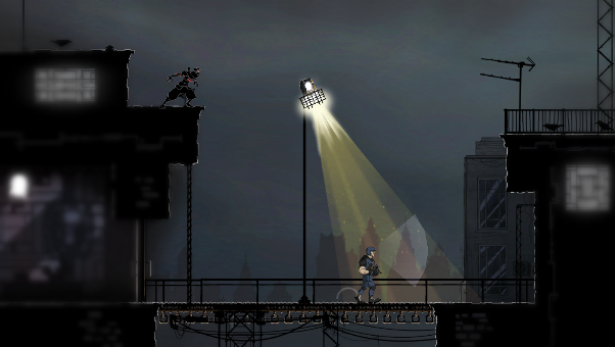 There are endless ways to dispatch of your enemies, and its up to the player if they want to shut off the lights and sneak through or dangle downed enemies off of perches to terrorize other baddies. As fantastically as the game plays, it’s a shame that there are only a handful of killing animations. A sword to the gut or a sword to the throat are the only available options until upgrades are purchased, but those don’t even vary much. It’s a shame that the animation gets to showcase every other part of the game except for the kills, because in case it hasn’t become obvious by now, the art style used by Klei Entertainment is absolutely stunning, harkening back to their hit Shank series. The gorgeous cutscenes are animated so well that they could easily pass for a TV show or film, and the in-game graphics are crisp and colorful. Whether crawling through a vent or dropping a chandelier on an unsuspecting ghoul’s head, the graphics are just plain jaw-dropping. That being said, there was one small issue that stemmed from the constant darkness of the environments. If you plan on playing this in a room that has any windows, then be ready for some glare issues. Even with the windows closed on an overcast day, there were a few times where I couldn’t see a thing on the screen. A black ninja suit in a black vent looking up at a black room doesn’t work too well unless you’re also playing in total darkness. Listening to the game isn’t quite as stimulating as watching it is, mostly because the guards are picked out of every other stealth game. Every single one of them sounds like a parody of stealth game enemies, screaming to each other when they find a body, and then forgetting about it ten seconds later. Even being spotted doesn’t warrant a search farther than ten feet from where they normally stand. But seeing as how this is one of the only complaints that can be said about Mark of the Ninja, it’s a tiny little sacrifice that is more than made up for in every other part of the game. It’s hard to describe how much fun this game is, mostly because it’s something that has to be played to understand. Fans of Shank will undoubtedly be drawn in, but let it be known that Mark of the Ninja is drastically different from Klei’s last effort. Even though Shank was one of my favorite downloadable titles when it was released, it’s easy to say that Klei has stepped up its game exponentially here. By the way, for full disclosure purposes, let it be known that I usually avoid stealth games like the plague. I’m a clumsy player who lacks patience, discipline, and literally everything else needed to enjoy stealthy endeavors. But even my two left thumbs were quickly dispatching goons through creative and colorful ways in no time, and I found myself stalking through the shadows feeling more powerful than a character has made me feel before. So if you’re like me and can’t even wait the two minutes for a Hot Pocket to finish cooking without throwing a cat out of a window, rest assured that this game is still for you. This may seem a little preemptive, but it’s easy to say that Mark of the Ninja will end up being one of the best (if not the best) game released on Xbox LIVE Arcade this year. Everything about this game screams creativity and straightforward fun, something that’s been missing from the more experimental titles released recently. At only 1200 Microsoft Points, it’s a steal for a game that stacks up to more than a few full priced released. Skip this at your own risk, because you’ll be missing one of the year’s best downloadable titles.